As 2013 winds down it is time for the annual reliving-making-cassette-mixes-for-friends moment. It’s really for me. I’m unwilling to give up on that visceral joy of stitching tunes together as a gift. However, this year, instead of mashing up music that my family enjoyed during the preceding year I’m giving in to listener feedback and actually posting holiday music. This particular half hour comes from a fun evening of back-and-forth joint DJ’ing the OpenGovChicago Holiday Party on Dec. 12 with DJ C, aka Jake Trussell. Jake’s set is not online, but his warmup is. Very best to you in 2014! Got the urge to muck with the Lost in Space theme recently. I loved the re-runs of that show growing up (and have deliberately forgotten that a movie was made of it in the 90’s). The theme I used began with the show’s third season. The title track is tiny, just one minute long with an unfortunate or awesome (your pick) Austin Powers breakdown in the middle, so there wasn’t much to work with. The arpeggios are emblematically spacey to me so I ran with that. I replaced The Robot with Siri, the panicky AI of our time (especially when using Apple Maps). I really should embed this on this site’s 404 page. Mix from last night’s always-enjoyable overlap of Beat Research and Urban Geek Drinks. A few older tracks (and a K-TEL easter egg) laced into the stew. Enjoy. I just realized I love Supertramp and always have. WTF. What else do Ilove that I don’t know that I do? Really the only way to get this out of my head was to mess with it. The Chicago incarnation of Beat Research has hit full stride. Jake, Jesse, and I are now in a twice-monthly groove (ahem) at Villains in the South Loop. And the first Wednesday of each month we overlap with the fantastic Urban Geek Drinks. All I need is for a NASA meetup to move in and I’ll pretty much have every interest covered. Here’s my set from last night. Sanford & Son, music for Sith lords, 1980’s classics, my first foray into house (I know, right?) and of course some Chicago love. Do enjoy. The set from Jan. 18 is available too, but not forever. 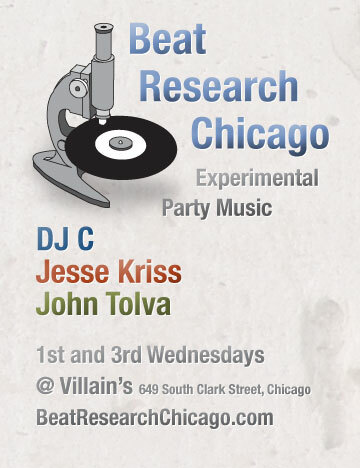 Here’s part of my set from the inaugural Beat Research Chicago at Villains last night. Fairly stompy with a bit of dubstep, drum and bass, and crazy Facebook users thrown in. It’s the first time I’ve used Ableton with Serato in a live setting. Not a complete trainwreck. There’s hope. Details and upcoming show info here. Pleased to announce that my pals Jake and Jesse and I will be hosting a local version of the venerable Beat Research. On the first and third Wednesdays of the month we’ll deliver a few hours of experimental party music at Villain’s in the South Loop. Jake (DJ C) started Beat Research in Boston in 2004 with Antony Flackett (DJ Flack) as a base for the genre-bending sets of music the two had been playing since the late ‘90s. Since inception, Beat Research has hosted some of the best and brightest DJs and producers of underground bass music in the world, given a number of young luminaries their first gigs, and presented an utterly motley collection of tech-addled live performances. The long list of special guests includes DJ Rupture, Kingdom, Eclectic Method, Ghislain Poirier, Vex’d, edIT, and Scuba. DJ C has since moved to Chicago (replaced by the incomparable Wayne Marshall) and, having missed those heady days in the Beat Research DJ booth, didn’t need much encouragement to be persuaded that this city could use its own explorations into innovative dance music. Beat Research has been hard to match for anyone seeking out extraordinary sounds. Now Chicagoans can look forward to their own weekly session for discerning dancers and enthusiastic head-nodders. More information and a mailing list sign-up at Beat Research Chicago. Toots at @beatresearch.